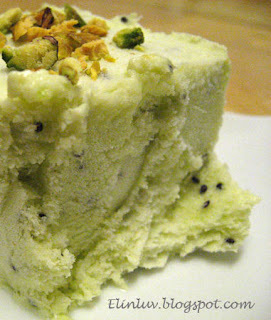 Homemade ice cream is so decadent, so indulgent, yet so simple. All you need is milk, sugar, eggs, and your imagination. 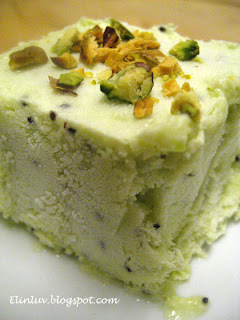 I tried using Kiwi fruits for the flavour for this homemade yogurt ice-cream :) Added some toasted pistachio as toppings. Its taste is unique and refreshing. It has a tangy taste coz I reduced the sugar. Piggy gal asked me one question.." Mom, have you eaten any ice-cream which uses Kiwi as flavour." and I answered her " Nope,but we have to be creative and daring " and her advice to me " Stick to mango...I like Mango " :))) For me, I love the tangy taste...it is refreshing ! Sleep In Comfort Is What I Need When I Travels !